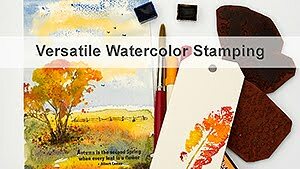 A big thank you to everyone who left a comment on my post for the Simon Says Stamp Gratitude Blog Hop. I so enjoyed reading all the comments, and many of them were very heartfelt and moving. 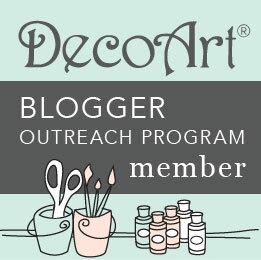 I was very happy to be a part of this great and very meaningful blog hop. 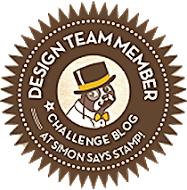 Simon Says Stamp will be in touch with you via email. Hi everyone! 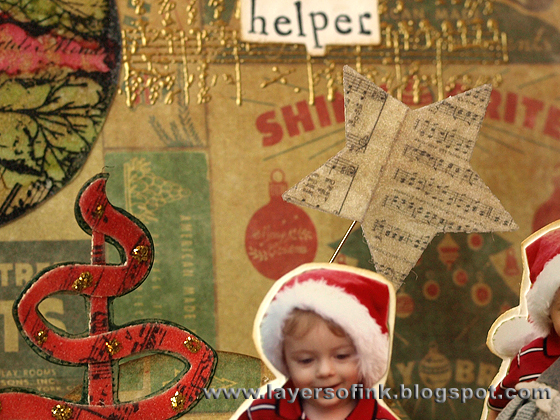 Today I have a Sizzix Christmas pop-up step-by-step tutorial to share, using Karen Burniston's pop 'n cuts system. 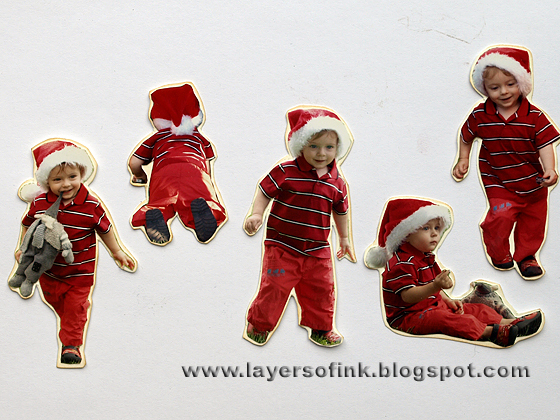 When I saw Karen's video of a pop-up card with a floating floor, I knew I wanted to try the technique with small cut out photos popping up on the floor. Don't miss Karen's video, it is great, you can find it here. 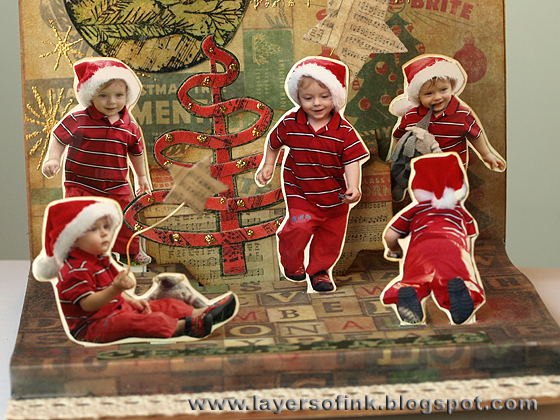 I used photos from last year's Christmas card photo shoot. I have taken this year's Christmas photos, but haven't developed them yet, so last year's photos had to do. They were already developed in a small size, so it was just a case of picking which photos to use and cutting them out. This card was so hard to photograph, with all the photos popping up all over, everything couldn't be in focus at once. My son loves opening this card and seeing himself as Santa's little helper popping up all over the card. I think we we will use it as an ornament, he is going to be upset if I give it away. 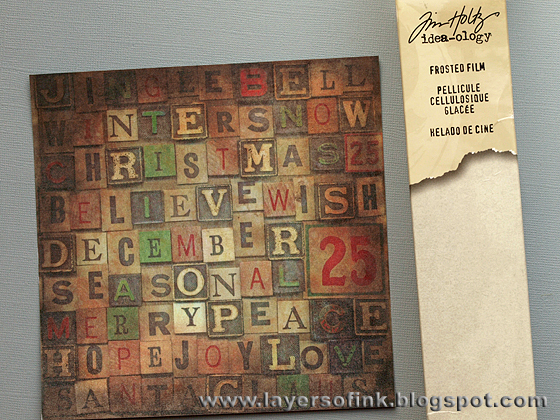 This would work for lots of other types of cards and photos too, not only for Christmas. This is the front of the card. 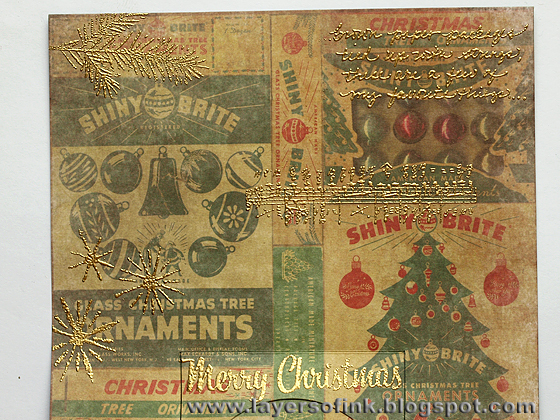 I wanted to do a card with traditional Christmas colours, green, red, and gold, and with a vintage feel. I don't use patterned papers that much, except for my favourites such as ledger and script. 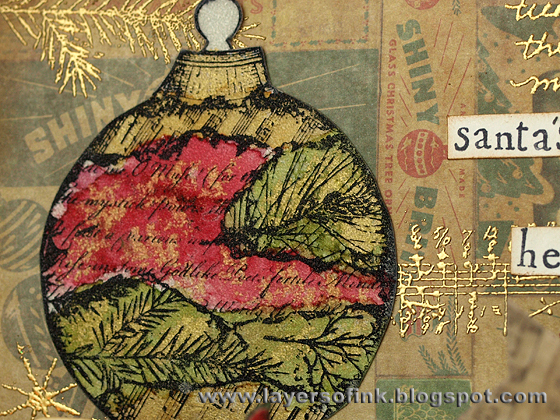 For this card I challenged myself to use patterned papers for my base, using papers from Tim Holtz's Seasonal pad. 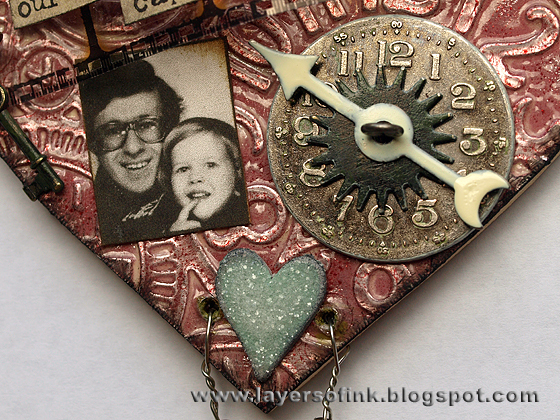 I've had fun playing around with Tim Holtz's new Frosted Film lately. Adhere Frosted Film to a 6x6 piece of patterned paper. The film is self-adhesive. To avoid bubbles, start applying the film from one edge of the paper, and burnish it down with your fingers as you go. 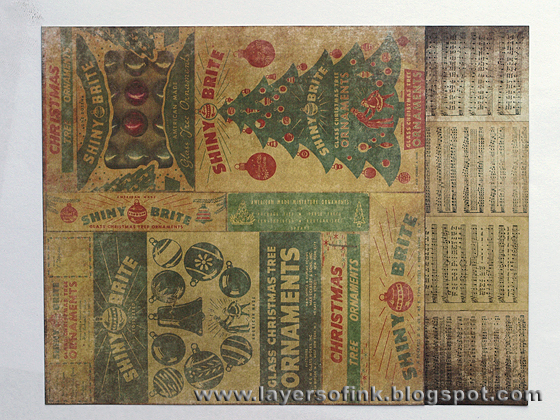 The film gives a lovely frosty shimmer to the paper, which is very hard to photograph. I love the look of all the photos popping up from this shimmery paper, but it does make the paper a bit more flexible, and the folded lines aren't quite as sharp. 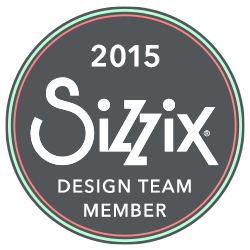 I didn't think it was a problem, but use a fairly heavy patterned paper. Print out Karen's great template and place it on your floating floor base. Make sure you place it so that the bottom of the template is at the top of your floor. Score along the dotted lines, since I made my card wider than the template, I just extended the score lines. Cut along the solid lines. 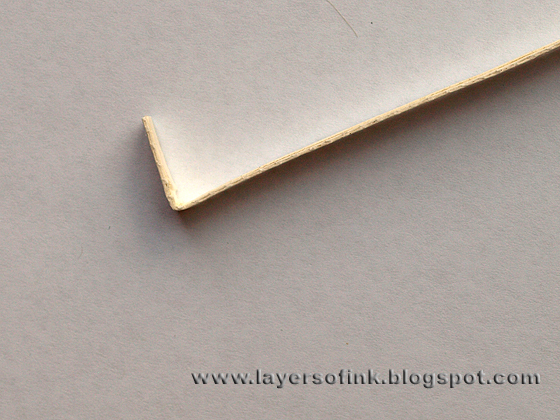 Fold along the score lines, using a bone folder. 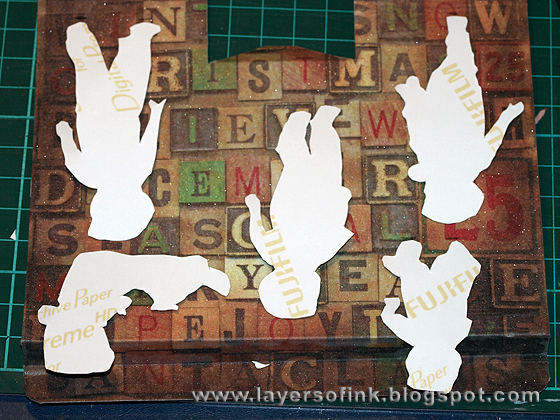 Cut out the photos and place them on the floor, make tiny marks where they need to go. I matted the photos on cream cardstock, to make them sturdier. 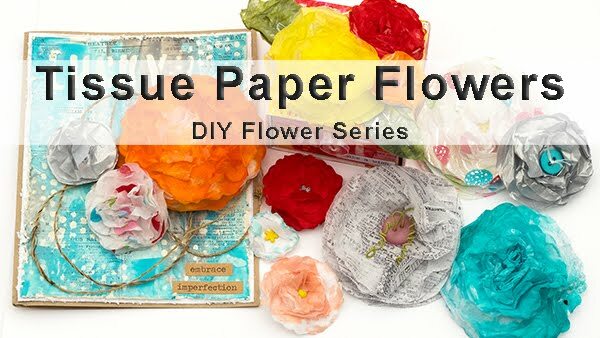 Cut slots in your paper using a craft knife. For the wider photos, I cut two slots, but it would probably have been enough with one. For the upper part of the inside, I wanted to use this full 6 x 6 sheet, which meant that I had to tape a strip of another paper (the music paper) at the base of it. I wanted the fold line of the card to be exactly where the two papers meet, and right in the centre of the Circle Label pop-up insert. Place the die with the cutting side on the paper, lining up the two marks on the die with the place where you want the fold to be, and make sure there is an equal distance to each side of the paper. To make sure the die wouldn't shift, I taped masking tape on top, first making it less sticky by taping it on my clothes. 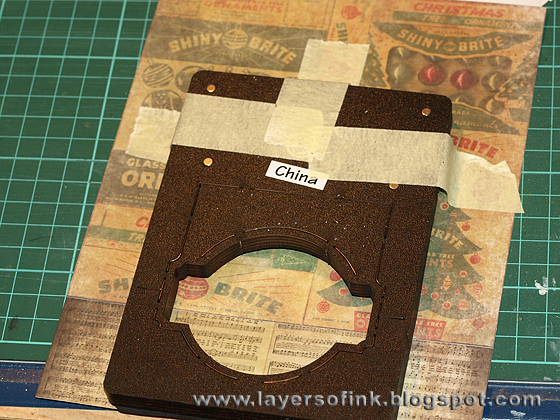 Since my card is wide, I couldn't use the Pop 'n Cuts base die, but instead placed it in my ordinary base tray. Here you can see that the card folds right where the two papers meet, and that there is as much of each paper in the circle label. 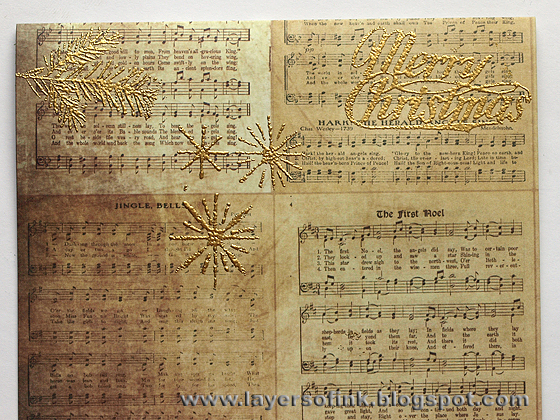 Gold emboss Christmas images on the patterned paper. 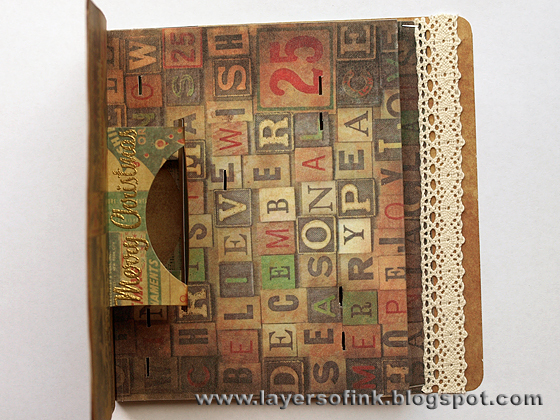 This sentiment from Stamper's Anonymous Tim Holtz Mini Holidays #4 fits perfectly on the little shelf of the pop-up. 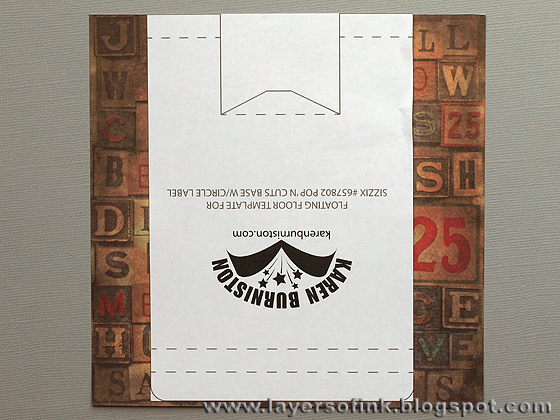 Add some gold embossing on the outside of the card too. Karen shows how to attach the floor in her video. First tape the pop-up to your cardbase, then place the floor flat, remove the tape backing at the top of the floor, and fold the top part of the card over it. Then attach the front of the floor. I added a little mini staple on each side at the front to make sure it would stick, and a piece of lace (to hide the slightly uneven paper). Now we can move on to the embellishments. 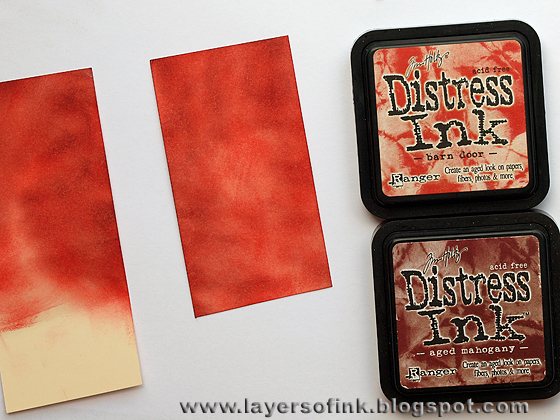 Ink some manila cardstock with red Distress Inks. 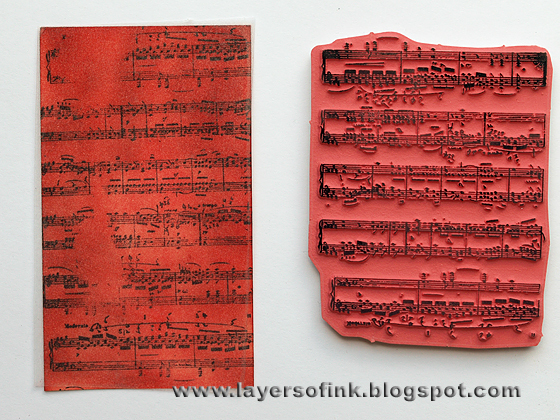 Stamp with a music stamp and then cover with the Frosted Film. Die cut the Ribbon Tree 3-D pop-up from green kraft core cardstock. 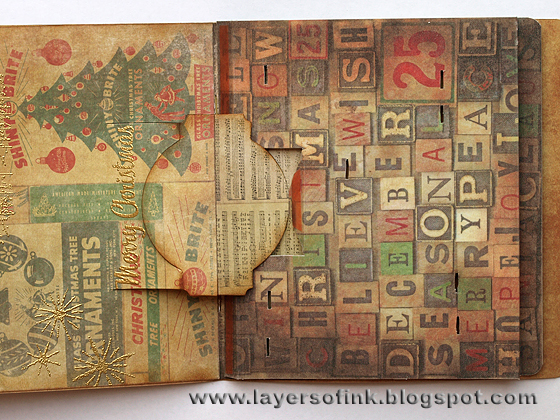 This is meant to be a pop-up, but can be used as a flat embellishment too. It is such a pretty tree (check back on Saturday when I'll be using it as a pop-up). Carefully sand to reveal the kraft core. Die cut the Ribbon tree from the Noel Sizzlits set from the red paper, twice. 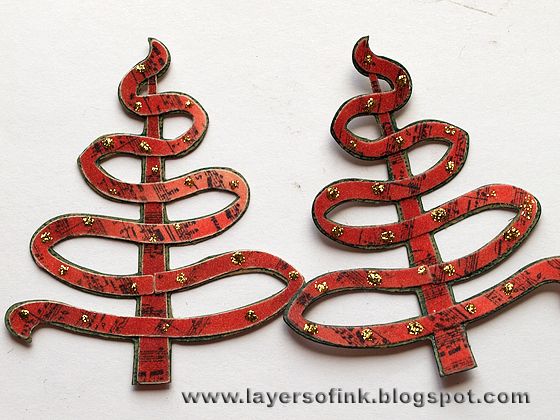 The second time, turn the red paper around (facing upwards), since the trees are mirror images of each other. Glue to the trees and add baubles with Golden Rod Stickles. 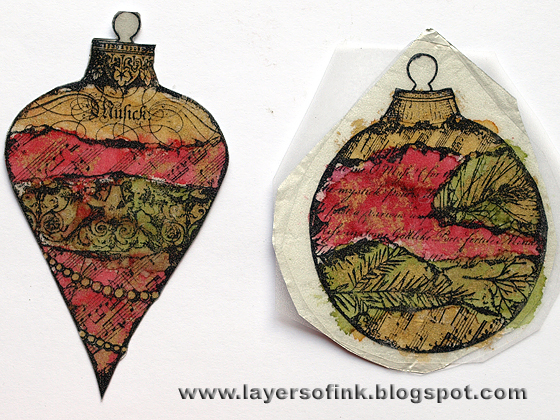 I wanted old fashioned baubles on the card and stamped these baubles from Stamper's Anonymous Classics #10 set on acetate with Stazon ink. You can use Archival Jet Black ink too, but it takes a little bit longer to dry. 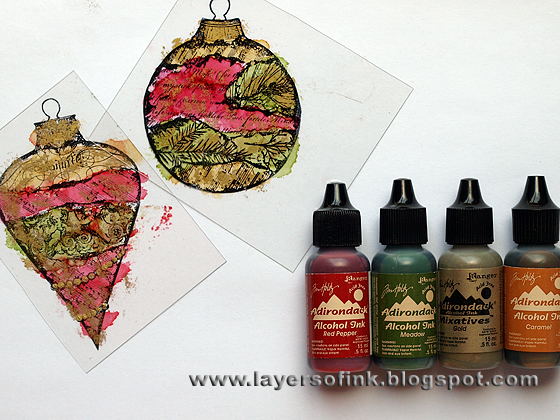 Colour the baubles on the back with alcohol inks. 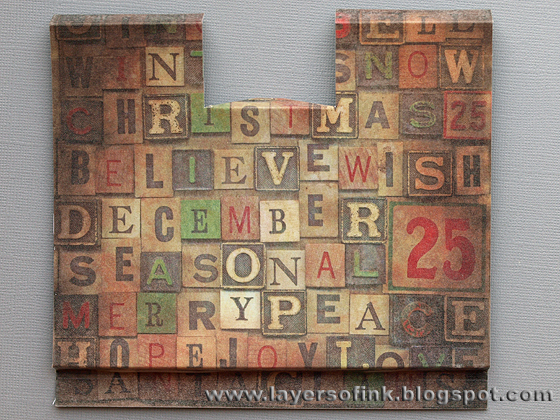 Glue the back of the baubles to aluminium tape and adhere Frosted Film to the front, then cut out. 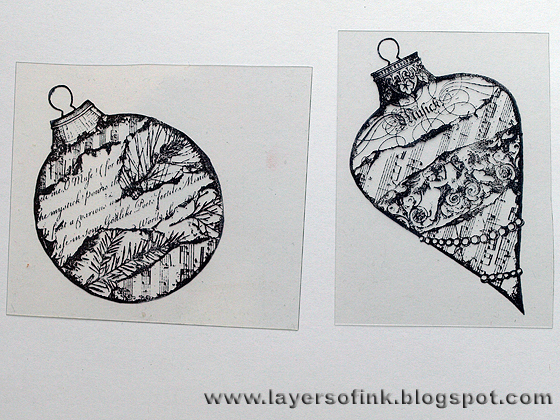 The bauble on the left is already cut out, on the right you can still see the tape and the film. The combination of alcohol inks, metallic tape and Frosted Film is pretty cool, but hard to photograph. 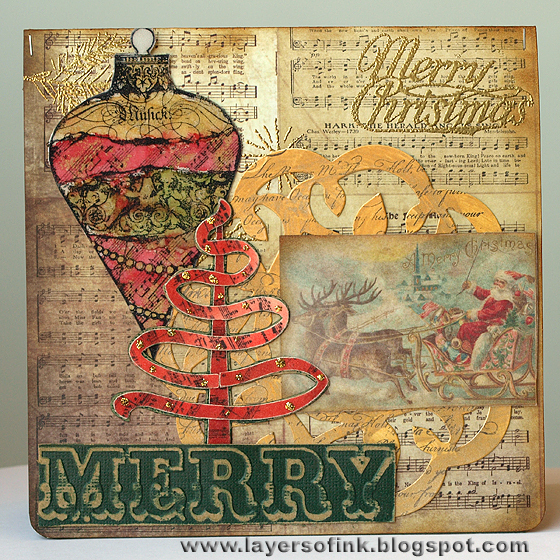 Die cut Karen's Ornate Plate from manila cardstock, colour with Tarnished Brass Distress Stain and when dry, stamp with a script stamp. Time to assemble everything. 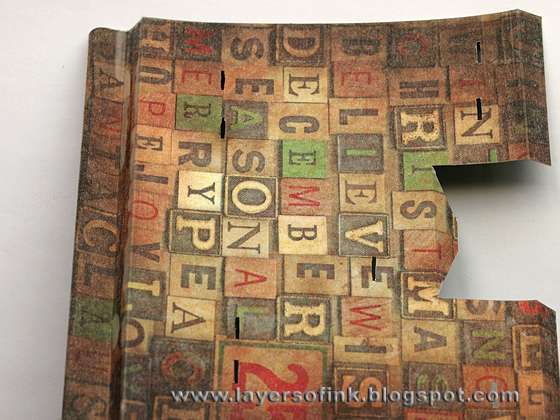 Use the Flagpole die to cut strips, this works nice since they are already reinforced. 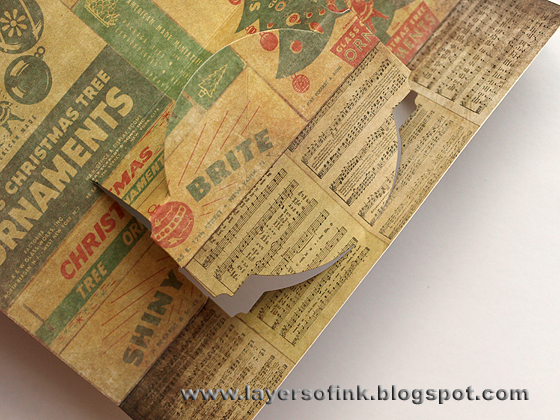 Alternatively you can cut strips of cardstock and glue together. Make a little foot and tape to the bottom of the floating floor, using a strong tape (this step is much easier to see in Karen's video). Tape the photos to the piece of that sticks out of the floor. I left it taller for the photos that are taller. Here you can see the photos from the top. 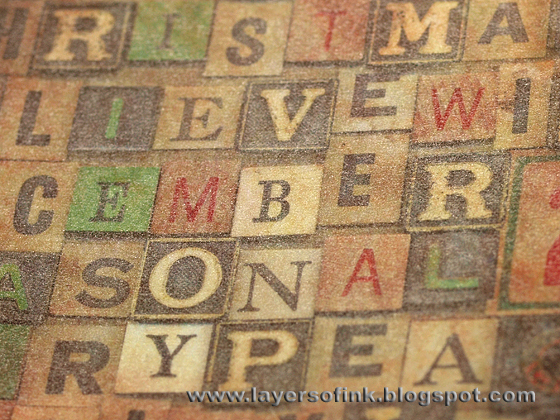 Use the Christmas Words folder and dry emboss a piece of green kraft core cardstock, sand and cut out a word. Another photo of the pop-up parts. 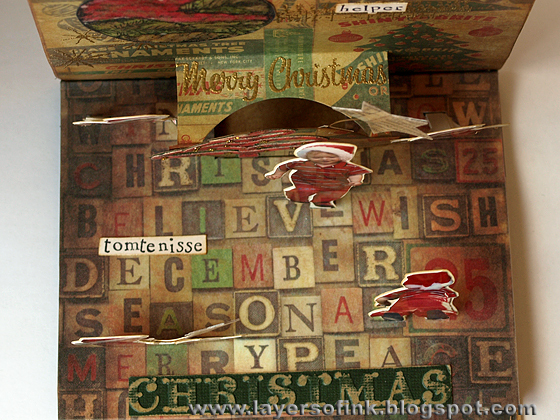 'Tomtenisse' means 'little Santa'. 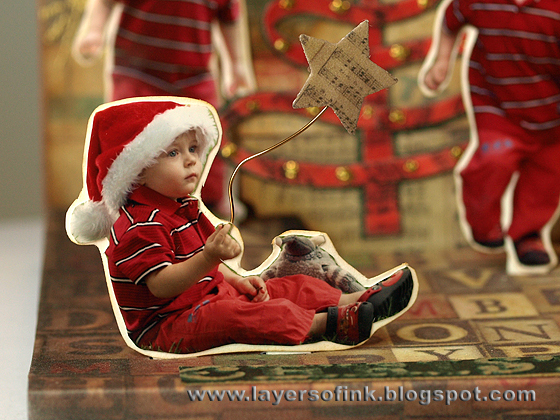 I die cut stars from a left over piece of patterned paper, which was first covered with Frosted Film. A piece of wire was sandwiched between two stars and I placed one in his hand, and a larger star on the circle pop-up. Here you can see the larger star, popping up behind the circle. Glue one of the trees to the circle label. 'Hang' a bauble from a gold embossed branch on the inside, and do the same with the other bauble on the outside of the card. 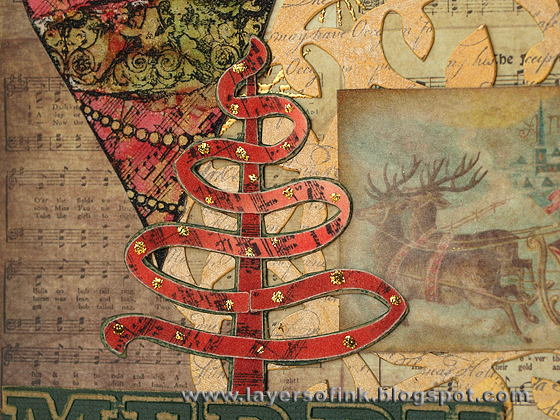 Layer the Ornate Plate, a vintage image cut from the patterned paper, and also covered with the Frosted Film, the tree and another dry embossed word on the outside of the card and you are done. Thanks so much for looking at this long tutorial! 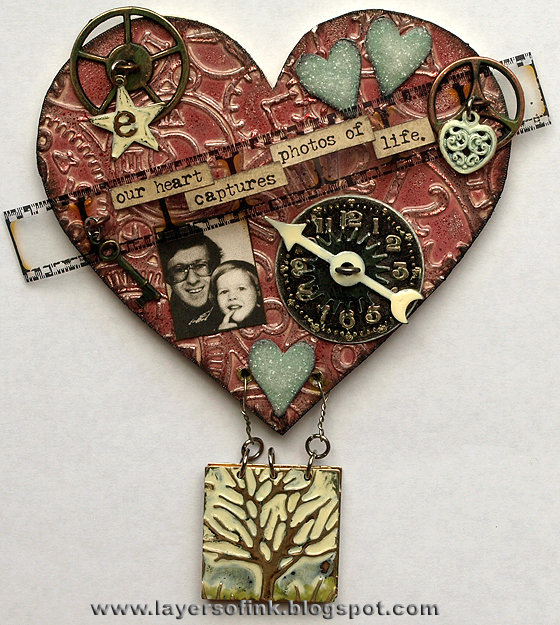 This week our challenge theme at Simon Says Stamp and Show is 'a project with heart'. 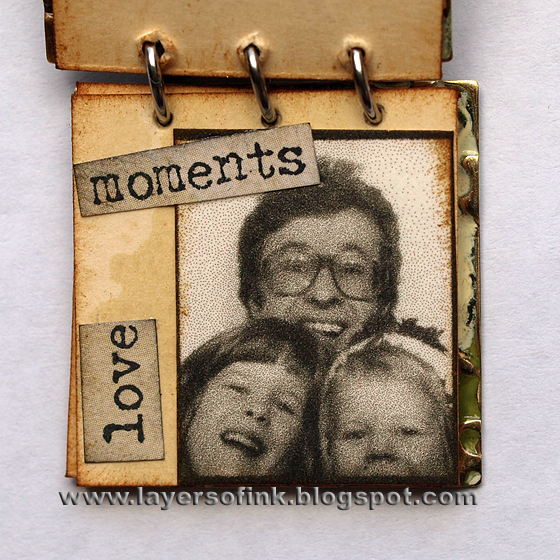 We have a special guest this week on the blog, Jim, The Gentleman Crafter. Don't miss his fabulous project, and he'll post a tutorial for it on Wednesday. I love using hearts and I found a forgotten blank wooden heart which I can't even remember when I bought and decided to alter it. Love it when something gets a whole new life. I had lots of fun making this little wall-hanging. I love mixing different types of metal and this heart was a great surface to play on. First, I adhered a piece of aluminium tape to glossy cardstock and embossed it with a clock folder. Then it was glued to the wooden heart. I painted the heart cream and wiped off the paint from the embossed parts. The heart was inked with Aged Mahogany distress ink and a little bit of Black Soot. Then I embossed the whole heart with clear embossing powder (distress ink wouldn't dry on metal, but the embossing powder seals the ink). Finally, the edges of the heart were distressed with a bit of Pitch Black paint. 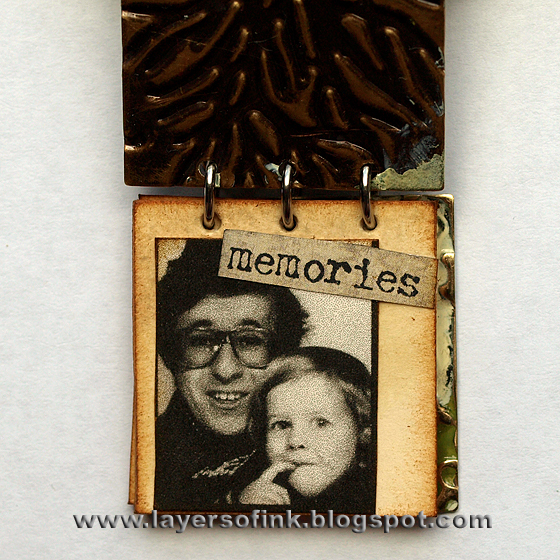 I printed some old photo boot photos on ordinary cardstock and used one of my dad and me on the heart. More photos were added in a little Vintaj inchie book. 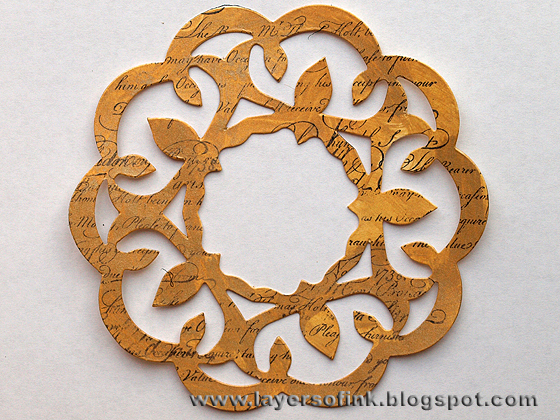 The Vintaj brass blanks aren't only for jewellery making, they are great for making your own embellishments too. The sentiment is a part of the long narrow stamp in Tim Holtz's Stamper's Anonymous Stuff to Say set, it is perfect to use for small sentiments - and I often like to use small sized sentiments. 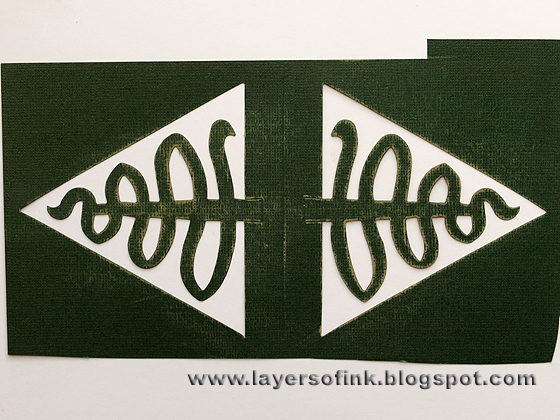 I glued it to a piece of Film Strip ribbon, which was attached to the heart so that it forms a dimensional 'bridge'. I attached it with the screw eyes that hold the gear and the little key. The small hearts were die cut from grungeboard, painted with Juniper dabber, covered with Glossy Accents and then sprinkled with Distress Stickles Rock Candy dry glitter, love that stuff. The little heart charm was in my stash, I painted it with Agate Patina ink. 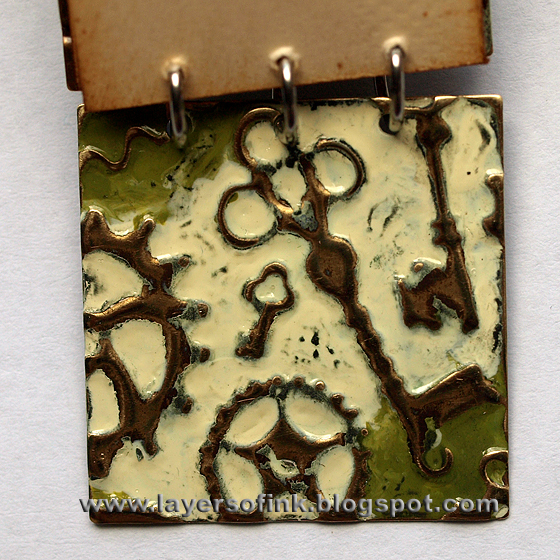 The gears were distressed with a bit of Moss Patina ink. 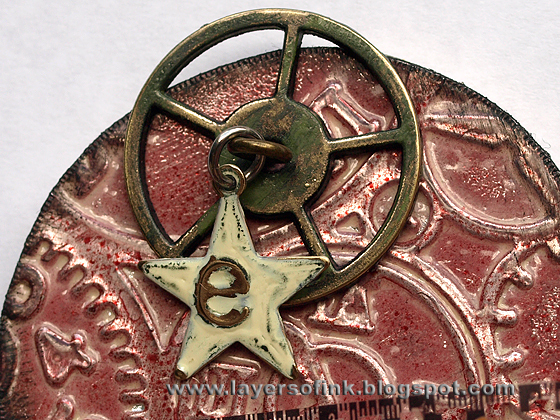 On the Vintaj star I embossed an 'e', for our surname, painted it with Agate ink and then burnished to distress, using the Vintaj reliefing block. 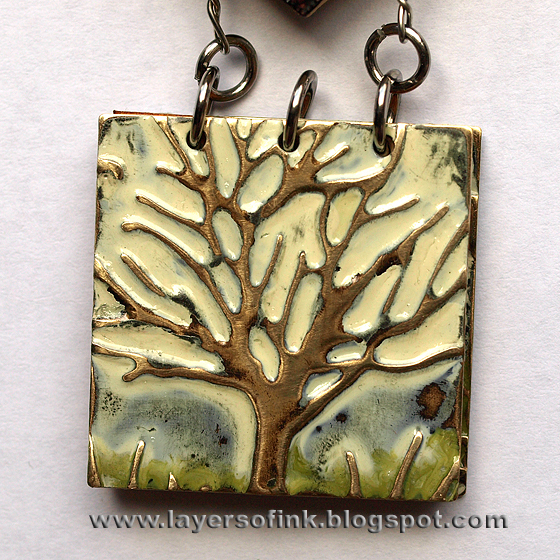 I have a thing for trees, and I thought it fitted on this project which is about family, time and roots. 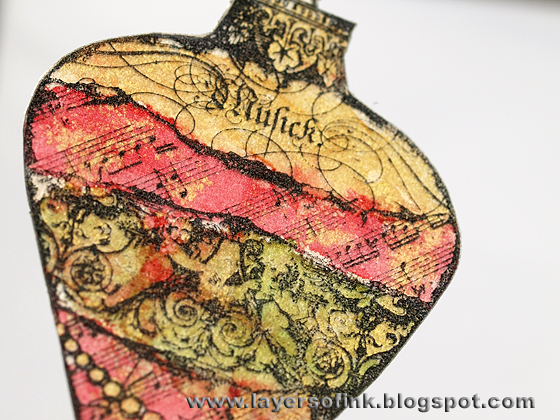 The lovely tree was embossed on a Vintaj Blank Journal Page. 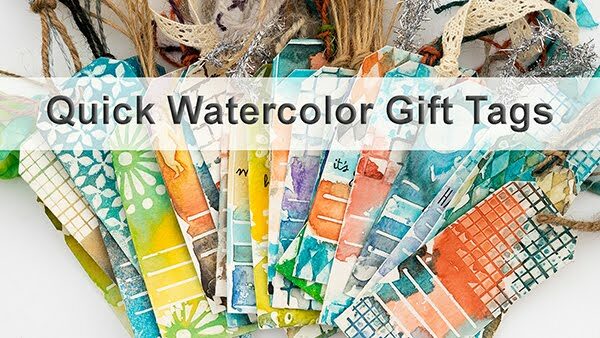 You can get a lot of different images out of one Sizzix Vintaj DecoEmboss folders, depending on the size and shape of the blank you use and where you place it. The grass was painted with Moss and the sky and tree with Agate. I used the reliefing block to remove the paint from the tree and the strands of grass. All the Vintaj pieces were painted with the Ranger Vintaj sealer to protect them. I inked inchie pages for the book and used more photo boot images inside, together with more words from the tall Stuff to Say stamp. I lined the pages up with the covers and poked holes for the jump rings, one page at a time. Another page. I wrote the dates at the back. My mom. The photos don't look quite this grainy in real life. The back cover of the book is embossed with gears and keys, to fit the theme of the heart, painted with the same inks and then burnished. 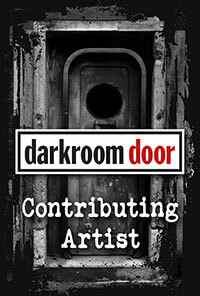 I hope you will join us this week and show us your creations 'with heart'. 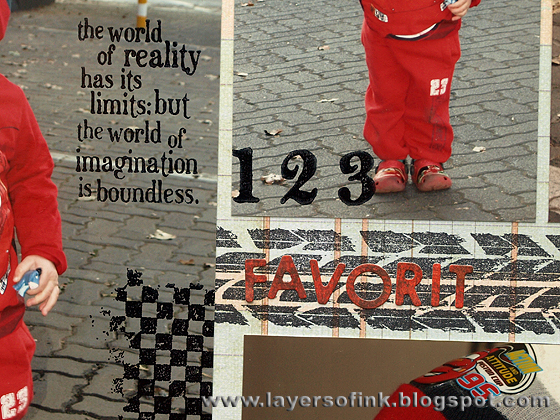 We love looking at all the gorgeous submissions to the challenge every week. 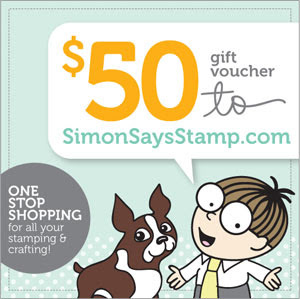 As always, our fabulous sponsor, Simon Says Stamp, gives a $50 gift voucher to one random participant. Hello! We have another wonderful CSI case file this week. I am always extra happy when it includes red, because I have so many photos featuring a large amount of red, like the ones I used here. 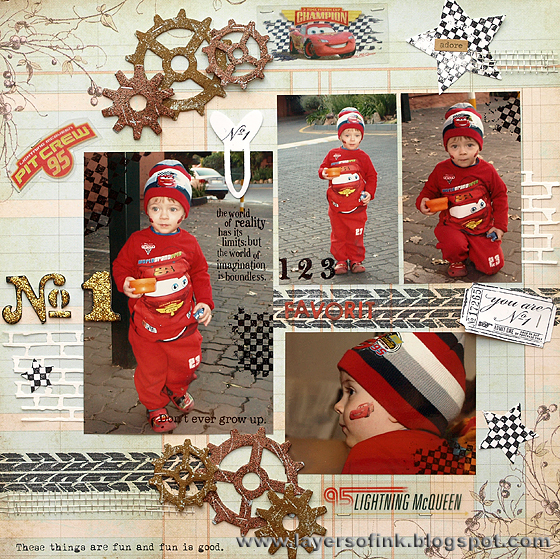 I've been wanting to scrap these photos of my son dressed up as his favourite cartoon character, Lightning McQueen. 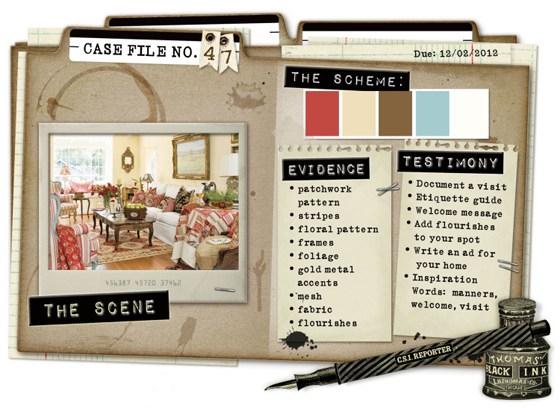 From the evidence items I used: stripes, foliage, gold metal accents and mesh. From the testimony items I wrote sort of an etiquette guide. The blue in my background paper photographed a bit lighter than what it is in real life. 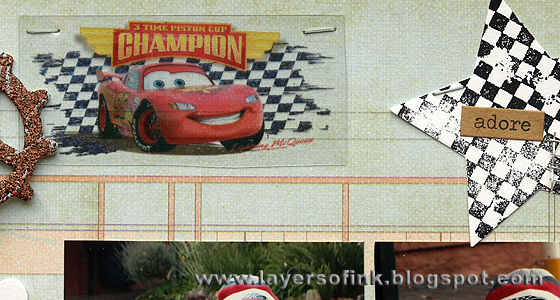 I 'borrowed' some of my son's Disney Cars tattoos and applied them to a transparency. They were stapled to the layout and are of course the favourite part of the layout for him. 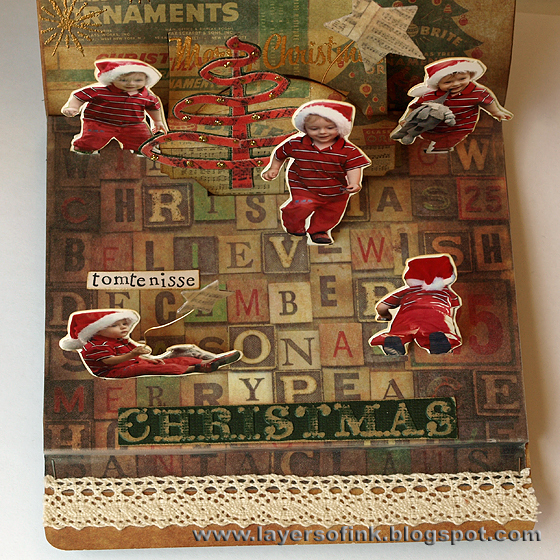 The stars were die cut with the Party Set #2 die and stamped with a pattern stamp, from Tim Holtz Stamper's Anonymous Ultimate Grunge set. 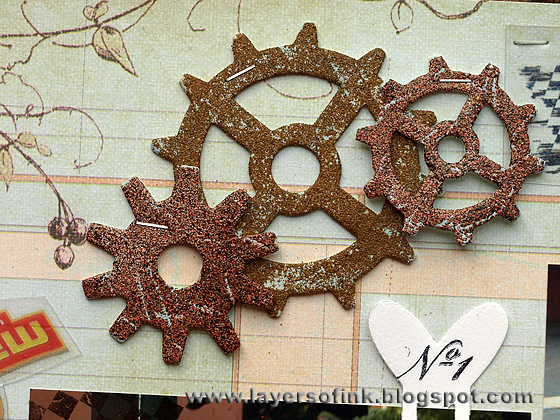 The gears were die cut from mat board and painted with a light blue dabber. 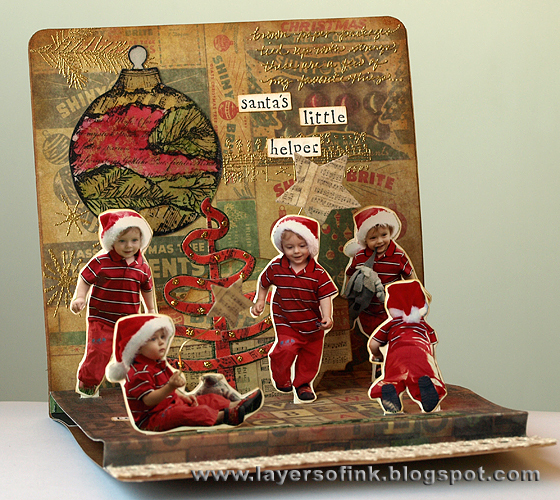 Then I embossed them with two different embossing powders Rangers Rust Antiquities and Distress Vintage Photo embossing powder. 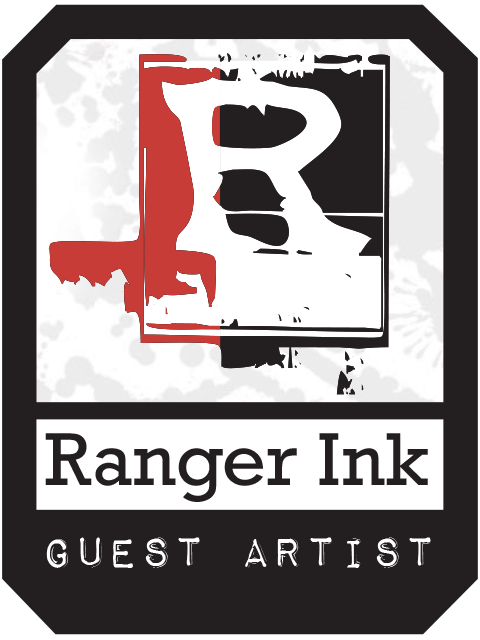 I used Ranger's new embossing dabber to cover them in embossing ink, so quick. Before embossing, I scratched off some of the powder with my craft knife. 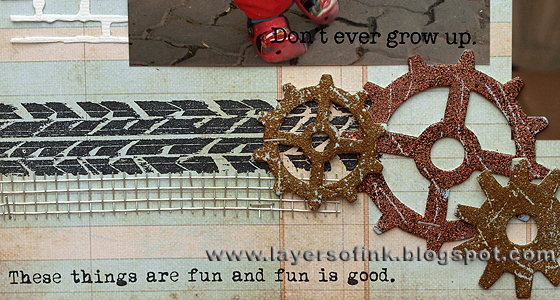 The large gear is embossed with Vintage Photo distress embossing powder and the small ones with the Rust powder. The heart paper clip comes from Karen Burniston's Love set. 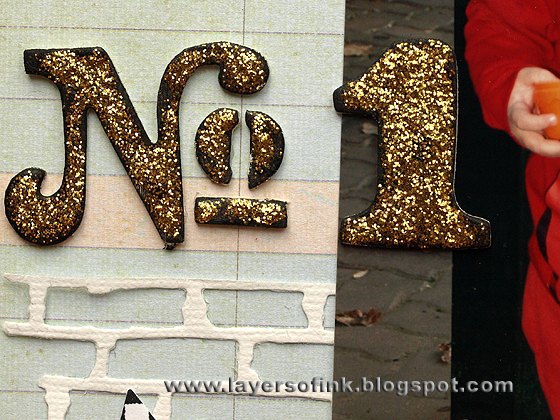 The 'No 1' was die cut from mat board using the Cargo Stencil Number die, painted black and the coated with Golden Rod Stickles. I also use a left over piece of brick wall die cut. 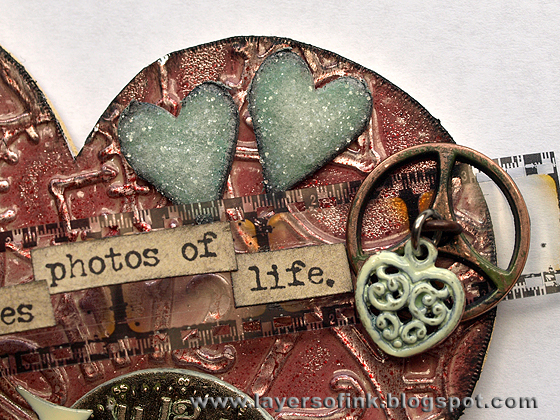 There was quite a bit of white space in my photos, and I did some stamping on the photos, using sentiment and pattern stamps. 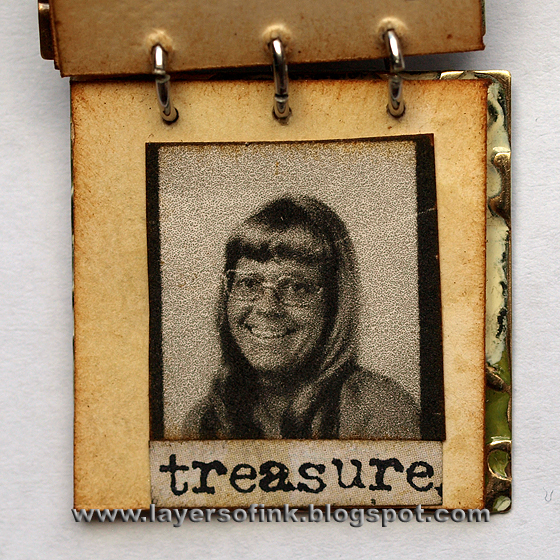 I also used some metal mesh, a great tire track stamp from Tim Holtz's Road Trip set and this awesome little sentiment from Artistic Outpost. Hero Arts pop-up card win!